Knowing the consumer behavior at different time frames and in specific dates (weekends or holidays) allows the managers of the gas stations to plan the commercial offer in order to launch special promotions or even to adapt the price of the fuels at those hours. 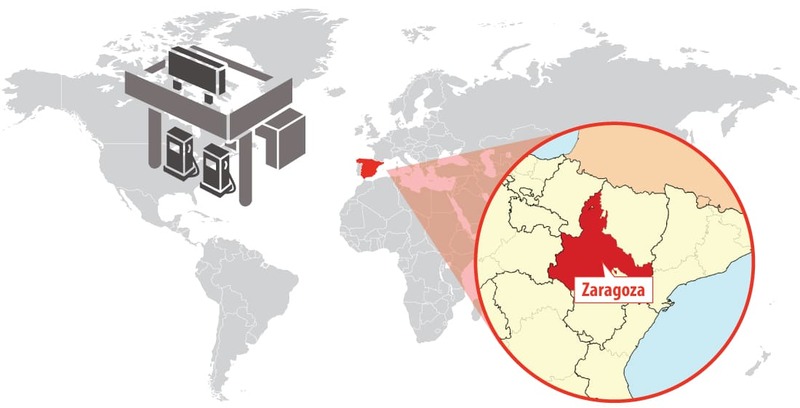 With this approach, Libelium has developed an Internet of Things project with a gas station holding from Zaragoza (Spain), called Zoilo Ríos, to monitor the traffic of vehicles in one of the most important service areas of the city. The aim of the project is to measure the incoming and outgoing traffic of the establishment by the detection of the Bluetooth devices of the cars. 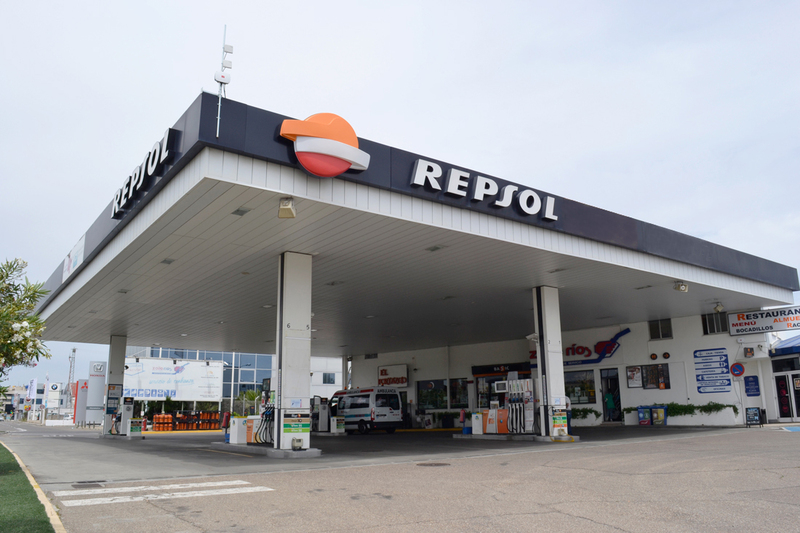 The service station that leads the holding, named El Portazgo, is placed in a very crowded traffic zone, in the direction of the exit of the city towards one of the major industrial areas, Logroño’s Road. Libelium has deployed this project taking into account the different objectives considered by the company group. In a first stage, the measurement parameters have been defined and the Meshlium IoT gateways have been installed. In the next stage, the gas company will manage the data captured to analyze and compare the vehicle movements registered to the commercial operations. Meshlium allows to detect Android and iPhone smart phones and, in general, any device with WiFi or Bluetooth connectivity. These IoT gateways are detectable even if they are not connected to a specific access point, allowing the detection of any smart phone, computer or hands-free kit of any car that enters into the Meshlium coverage range. The first one is knowing the rate of vehicles that access to the service area and do not refuel. This data can be compared with the number of other operations in the shop, the cafeteria or car-wash, so the company can decide to promote special services only in case of refueling. Besides, the fuel company wants to know the average length of stay of the vehicles in the service area with the aim to contrast it with the average time of refueling that registers its own control system. This information can also reveal an increase of vehicles that do not wait to refuel in case of having a long waiting queue. On this sense, the manager can verify if the extra cost of personal recruitment invested in special dates has been returned. The project has also planned to measure the traffic volume that pass along the road in front of the gas station every hour to define the highest timezones. Then, the company can compare the data with customer consumes in order to plan specific campaigns at those times. Finally, data registered allows to measure the vehicle movements related to commercial operations registered to check the impact of the promotions in the services demanded. As Zoilo Ríos, CEO of the holding, explains, “knowing the traffic density in this road is a strategic information for gas stations management to calculate the volume of potential customers”. The Spanish Ministry of Development publishes this data, called IMD (daily traffic density index of a road), but with a delay of one year and a half and based on medium rates. With Libelium technology, the service area can access to this information in real time to adapt the prices of products and services depending on the expected demand. Up until a few years ago, gas stations in Spain only could change the fuel price once a day. Actually, this price fluctuations can be applied every hour, with the legal price notification to the regulatory authority. With the new law, the pricing policy has changed as it is not a petrol company competency so each station tries to develop its own system to estimate price elasticity depending on customer behavior. 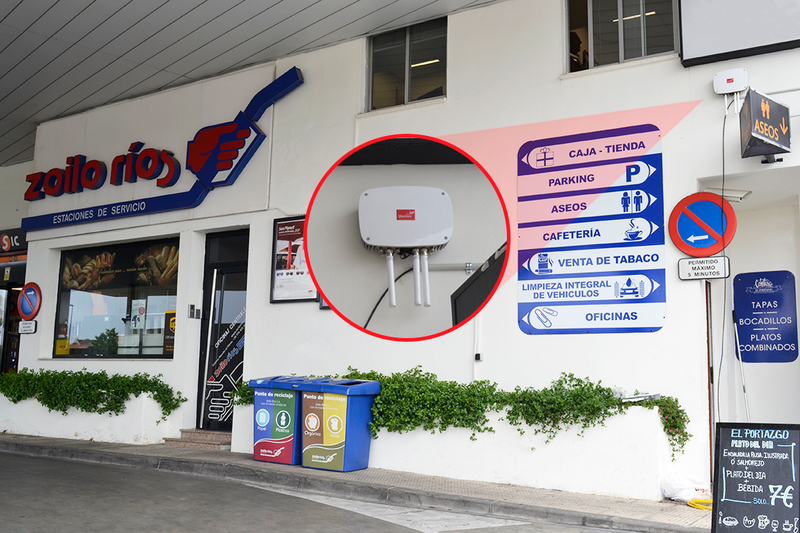 Zoilo Ríos holding has also detected other appliances of Meshlium Scanner technology as measuring traffic volume to define new locations to invest in new service areas. The Libelium Engineering Project Team has installed three IoT gateways in the service area. One is placed in the upper part on the eave of the roof pointing out to the road to measure the vehicles passing along it. To monitor traffic, this Meshlium includes the special pack of two directional antennas that extend the scanner range of WiFi and Bluetooth in the sense required. 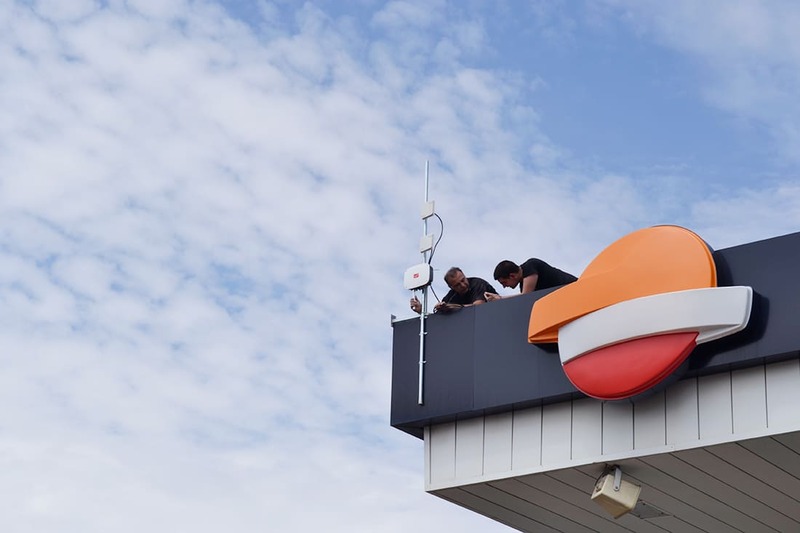 Besides, the installation team has placed one Meshlium on the main facade of the building and the other on the exit corner to avoid interferences and differentiate vehicles entering and leaving. The IoT gateways include all the radios prepared to install and just ready to start working. 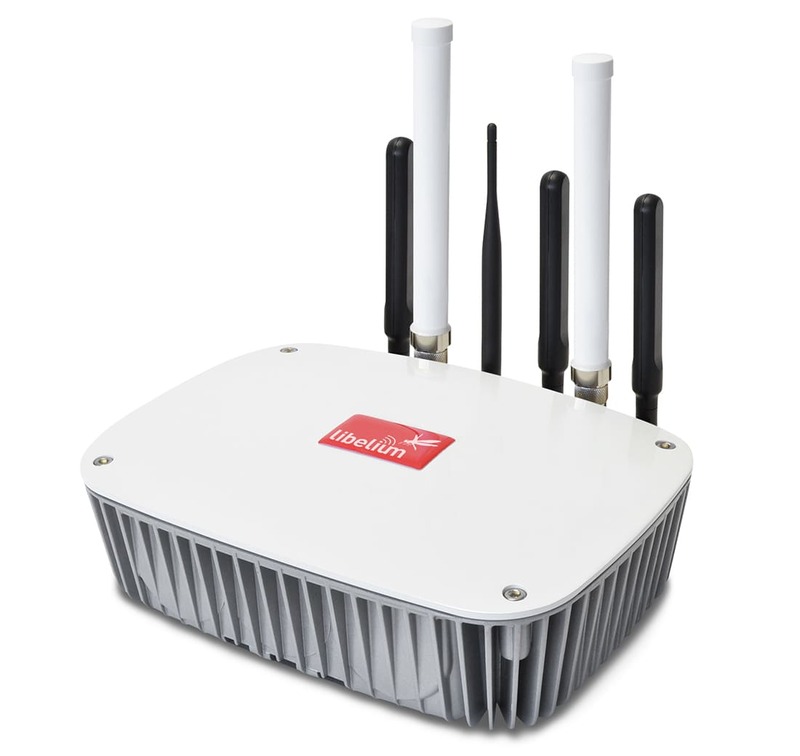 In fact, all Meshlium units create a WiFi access point once they are connected for the first install process. The access to Meshlium’s interface, the Manager System, can be made from a PC, tablet or smart phone. One of the main requirements of the project is the continuous synchronization of the three Meshlium devices. The NTP service cannot be executed each time that Meshlium restarts so the hour can only be synchronized by pressing on “Time update” button on the Manager System. A customized configuration of Meshlium has been developed for this project so the daemon of the NTP service has been activated to obtain a continuous synchronization without user intervention. This kind of configuration involves secondary effects in the devices needed to reach a long synchronization. For that reason, the NTP date service with initial date and hour has been implemented only one time and has been disabled. Data gathered by Meshlium is stored locally into a MySQL database. 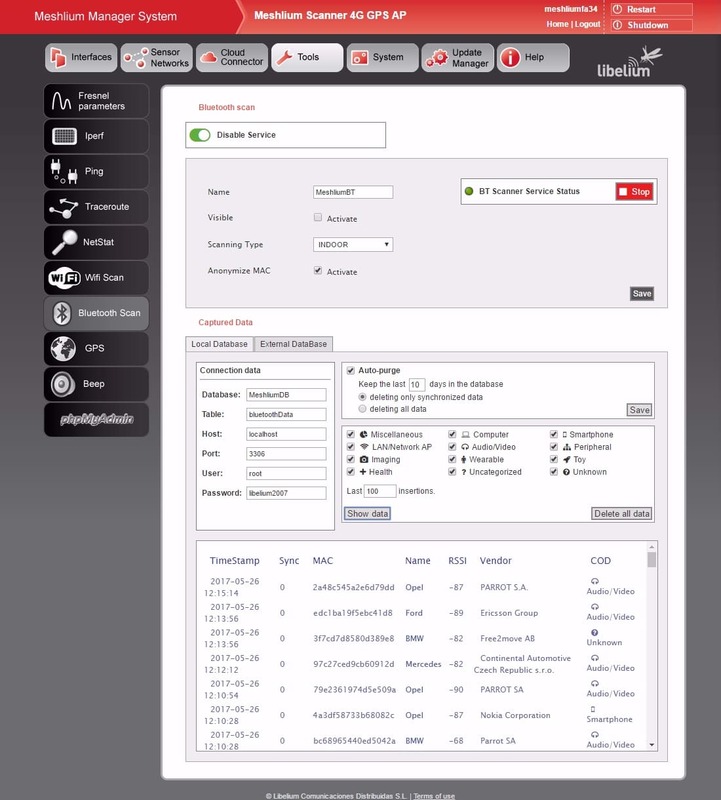 It is also possible to synchronize the devices detected by Bluetooth and Wifi that are stored in the local database, with an external MySQL database of the user. The project is in the data capture phase for its later management with the analytical tools of Zoilo Ríos Group that could replicate it to other establishments of the chain and even to other companies of the sector. “The opportunity to monitor the traffic in real-time allows to include this information in the data gathered by the management system Dyngas developed by the company Advance Soluciones Informáticas, S.L. based on Microsoft Dynamics NAV ERP. 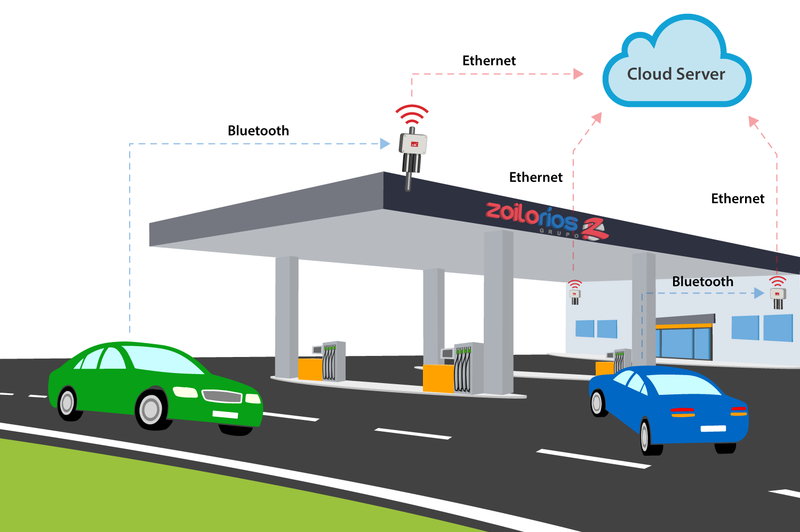 Traffic information at the service station, and also from the access road, is incorporated to the wide data base (Big Data) of DynGas system enabling to carry out data analytic to draw conclusions about the customer behaviors. This analysis allow to predict sales and maximize benefits by setting prices depending on the real-time traffic”, state Ignacio Ríos, Technical Manager of the holding.